Between Red Mountain Pass and the town of Telluride to the west is a high ridge of CO 13ers that I guessed would make an enjoyable traverse. I had been in Ouray the previous day looking over maps and summits in the area and it seemed like this trio would make for a nice half day outing, giving me plenty of time to drive to Telluride where I was due in the afternoon. County Road 16, a 4WD Jeep road, runs from Red Mountain Pass to Black Bear Pass on the crest before dropping to Telluride on one of the more advanced OHV roads in the area. In the absence of an actual trail, I decided to use this road to hike to the crest, then head north to tag the three summits in succession. My 7a start was not early enough to avoid the first vehicles plying their way up the road, but there were only a few and the folks were friendly enough to wave and slow down, keeping the dust to a minimum. The road climbs almost 2,000ft in three miles through beautiful Mineral Basin, framed by Peak 13,477ft on the left and Trico Peak to the right. I heard what I thought were cattle lowing in the distance only to find when I'd reached the upper basin that they were hundreds of sheep grazing the south side of the basin about 1/3mi distance from the road. I had little idea if they were wild bighorn sheep or the domesticated variety, but their large numbers had me believing the latter. It took about an hour and twenty minutes to reach the crest where I watched a handful of vehicles go over the other side and into Ingram Basin. At the end of a spur road on the crest was a memorial cross for a Michael Hasten. No dates were given to suggest how long the makeshift iron cross might have been there, and nothing came up on a cursory online search later. I turned my attention north and followed the class 2 ridgeline to Trico's summit in 15min. The weather was cooperating more so than it had the previous morning, leaving fine views accented by lingering clouds. The view west is dominated by Ingram Basin 1,500ft below. 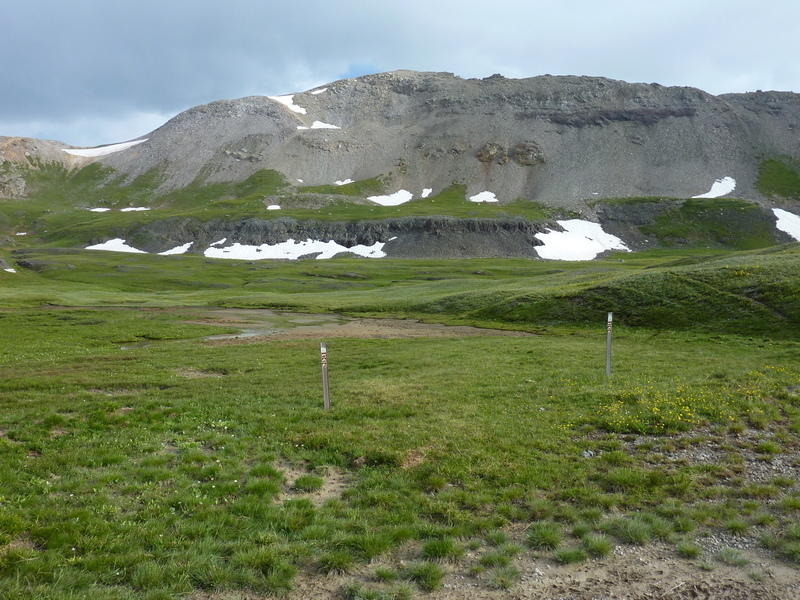 To the north stretches the ridgeline leading to the next summit, unnamed Peak 13,510ft. I descended Trico's North Ridge which requires some caution but still just class 2 talus and rock as it drops to a saddle marked by a survey marker left by one of the mining companies of old. The climb to Peak 13,510ft then becomes an easy affair on more gentle terrain, reaching the highest point I would manage this morning. This summit offers an unobstructed view down to Telluride nestled near the end of a box canyon. Only 4mi as the crow flies, it would be more than an hour and a half of driving from Red Mtn Pass back through Ouray and then around to Telluride. A register left by the CMC (Colorado Mountaineering Club) showed more than a dozen entries this month alone - I can think of only one 13er in CA (Mt. Dana) that receives more visitors. Coloradans seems to love their mountains far more than Californians. It had taken 45min to get from Trico to Peak 13,510ft and would take another half hour to reach Telluride Peak a shorter distance to the north. Along the way I came across a wary fox that watched me for a few moments before trotting off out of sight. I noted Ptarmigan Lake below to the east with old mining works or a cabin by the water's edge - it would be interesting to pass by for a look-see on my way back. It was 10a by the time I reached the summit of Telluride Peak. It was odd that this summit was named for the town as it can't be seen from Telluride (nor can the town be seen from the summit as the line-of-sight is blocked by lower Ajax Peak to the west). The summit does have a pretty good view to Savage Basin, home of the Tomboy ruins, a once-bustling community that served various mines in the basin. To the north is Imogene Pass over which Tomboy Rd runs, the other 4WD Jeep road that rises out of Telluride, this one dropping north into Imogene Basin and eventually down to Ouray. This 2-way road is more popular than the Black Bear Pass route, evidenced by the dozen or more vehicles that could be seen plying the steep road. Another half dozen were parked at Imogene Pass where the occupants got out to take in the views. I briefly considered continuing north to the pass but decided on a more expedient descent directly to Ptarmigan lake. The building at the lake turned out to be a large 3-room cabin - someone looked to have lived well here for a time before abandoning it. Mine works littered the grounds around the cabin and the lakeshore. I continued south on an old road into the next basin, unnamed on the topo map. A smaller cabin was found here at the site of the Senator Beck Mine. I found remnants of an old pack trail depicted on the topo map but no longer maintained, which I used with some cross-country travel to descend the basin back to County Road 16 and my van parked at Red Mtn Pass. Bob, how long has Plunko been hiking with ya? Plunko is on loan from my daughter for this particular trip. He first joined me more than five years ago. Ha! I drove over Red Mtn Pass yesterday!